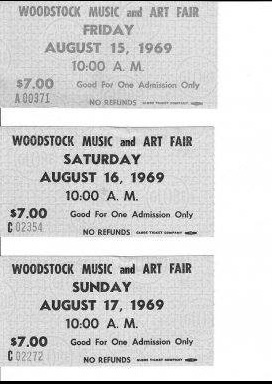 Woodstock may well rank as one of the significant political and sociological events of the age. . . [T]he revolution it preaches, implicitly or explicitly, is essentially moral; it is the proclamation of a new set of values. . . With a surprising ease and a cool sense of authority, the children of plenty have voiced an intention to live by a different ethical standard than their parents accepted. The pleasure principle has been elevated over the Puritan ethic of work. To do one’s own thing is a greater duty than to be a useful citizen. Personal freedom in the midst of squalor is more liberating than social conformity with the trappings of wealth. Now that youth takes abundance for granted, it can afford to reject materialism. Woodstock represented a new culture of opposition. It grows out of the disintegration of old forms, the vinyl and aerosol institutions that carry all the inane and destructive values of privatism, competition, commercialism, profitability and elitism. . . For people who had never glimpsed the intense communitarian closeness of a militant struggle—People’s Park or Paris in the month of May or Cuba—Woodstock must always be their model of how good we will all feel after the revolution. . . [P]olitical radicals have to see the cultural revolution as a sea in which they can swim. There emerged shortly one-word rebuttal to this childlike idealistic nonsense: Altamont. Now the site of a huge wind farm, which is ironically fitting.